This entry was posted in Government and tagged flags. Bookmark the permalink. Does it count if I read “anonymous’s answer and say South Carolina? But, but, but . . . look at that crescent! It’s Muslim! Has Sarah Palin seen this? The U.S. Navy stationed me in Charleston, South Carolina for three years, so I know some things about their culture. I can tell you for instance that not all of them are at all convinced the Civil War is over. The crescent on their flag probably represents not a crescent moon but a gorget, which is a piece of armor for the throat. However, I doubt Sarah knows that. I have an old friend in Charleston, whose late mother would only refer to the Civil War as ‘the recent unpleasantness’. Whether crescent, a common heraldic device and part of John Rutledge’s family coat of arms or a gorget, is a matter of dispute. However, the flag used by the 3 companies of volunteers who took and held Fort Johnson during the Stamp Act protests was a blue field with a single white crescent in the upper left corner. Home of the Slave Trade, where the average IQ never tops the daytime temperature. He lives! And joy is heard throughout the land (especially here). 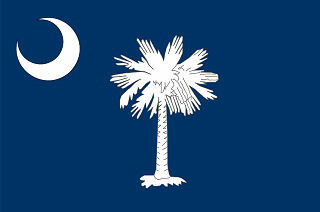 Could be though, couldn’t it..
Palmetto Tree and a Cresent Flag? Well james, it’s a palm for sure . . .
Having recently returned from the Arabian Peninsula, I recognize two of the three hallmarks of Moose Limbs: palm tree and crescent moon, but no camel. Unfortunately, I knew some SC natives when I was in the Army. Despite being one of the few former Confederate states without any trace of the Confederate battle flag on its current flag, SC is far and away the most Lost Cause obsessed of the bunch. I know you to be a polite sort, desertscope, so I actually didn’t read it as a slur. Althoough it was entirely new to me too. Why, that would be the SC flag which used to fly between the American flag and the Confederate battle flag atop the SC capitol building. I think that, after much protest, they may have moved the Confederate flag to fly in another spot on the grounds. Hi marylee – I think you’re right, they moved it. It would be like flying the Union Jack alongside the Stars & Stripes, cuz hell! we were once British too! South Carolina?? For real?? Where’s the golf club?